Restoring and repairing vintage cars requires not only the greatest craftsmanship and skill. 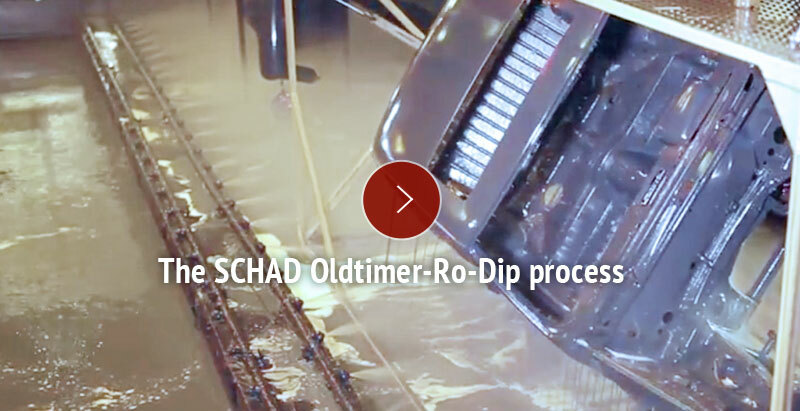 We equally apply innovative technologies at SCHAD Oldtimer Manufaktur to lastingly preserve or to restore car bodies, paint, chrome parts and other fittings. 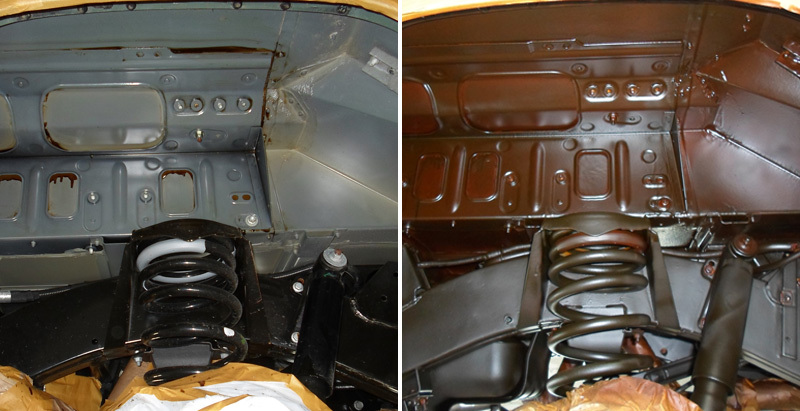 An impressive innovation in the restoration of vintage cars is dry ice blasting. Compressed air propels ice pellets through a tube, thus forming a precise jet which can be used to clean dirt and other unwanted substances from metal surfaces. Upon contact, the ice crystals penetrate the dirt layer and vaporise instantly, expanding in volume by a factor of 700. In this way, anything adhering to the underbody of the car – underbody sealant, coatings, waxes, or dirt and contaminants – is blasted off in a fraction of a second. The key advantage compared to other blasting techniques is the non-destructive approach which is gentle on materials: The original surface does not undergo any erosion whatsoever. 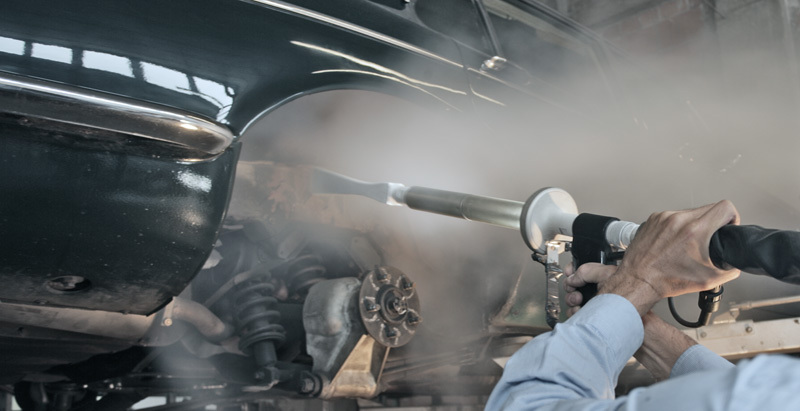 Dry ice blasting is thus the gentlest and most efficient process for removing layers of dirt and other unwanted substances from a car without any water being used. Dry ice blasting is a very environmentally friendly process. Since the abrasive material is completely vaporised, only the layers of dirt and unwanted substances which are removed must be disposed of once the work is completed. The CO2 used is a waste by-product of industrial processes such as the extraction of natural gas. This means that no additional CO2 is produced. After all unwanted layers have been removed from the car body, frame and aggregates by means of dry ice blasting, the next stage is granule blasting. The process is similar to that of dry ice blasting. Here again, the abrasive material is blasted against the surface to be treated using compressed air. However, granule blasting usually causes a certain minimal erosion of the metal surface itself. The degree of erosion depends on the air pressure and the type of abrasive particle used. In dealing with corrosion damage, we use aluminium oxide or aluminium silicate as the abrasive material, with varying degrees of granularity, in order to achieve the desired abrasive effect. We use fine glass powder for metal surfaces that have undergone processing such as welding or intense heating; with glass powder the erosion is minimal, and the metal surface is bright as a result. Plastic particles perform well without causing any erosion. One of the finest-grain granulates is maize flour; here as well, the surface under treatment is not roughened at all, meaning that it can be used to blast-clean even delicate fittings, interior fixtures and emblems. This is just a few examples of the many different blasting materials we use to achieve a wide variety of results. Granule blasting is carried out in preparation for high-quality paint application or powder coating, e.g. of lattice tube frames, axle constructions and other car parts and components. The key is to apply the anti-corrosion protection coating, or other desired coatings, immediately after the granule blasting treatment. When you decide to have your vintage car restored, you want to be sure that the investment will pay off over the long term and that you will not find yourself facing new corrosion damage after just a few years. With our patented Oldtimer-Ro-Dip process, we give you our guarantee that corrosion will never again be a concern with your vintage car. On a lifelong basis. This unique anti-corrosion protection is the result of many years of research. We achieve it by combining two processes: cathodic dip coating – a standardised industrial process which is a widely used, proven method of protecting metals against corrosion – and rotation. The vintage car body is dipped in a series of basins, each containing a specific chemical. Even with a number of holes drilled into the body beforehand, bubbles can form during dipping, with the risk that corrosion will set in at these points later on. We developed our proprietary rotation method specifically for vintage cars to prevent this – and received a patent for it. This method ensures that the coating penetrates smoothly into every angle and cavity. Finally, the coating is fixed by heating it at temperatures of more than 200 degrees Celsius. The anti-corrosion coating is now evenly applied and fully effective. 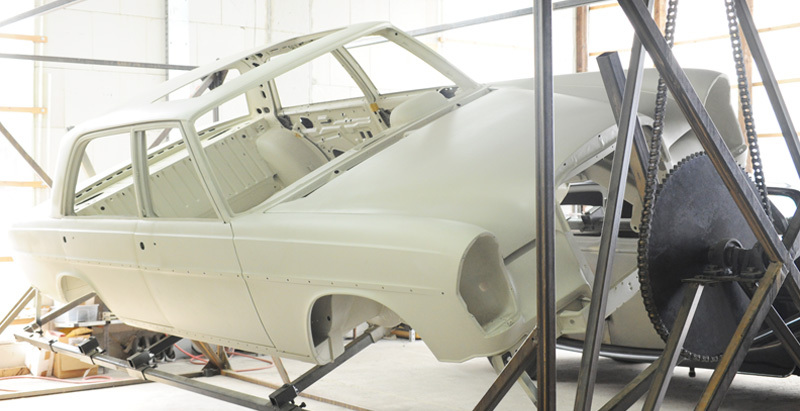 Our Oldtimer-Ro-Dip process for vintage cars is available only as part of a complete restoration, since the process is possible and feasible only with a fully restored car body. Your car can be lastingly protected against rust even without full restoration. We accomplish this through a multi-stage process. The key factor for long-lasting protection against corrosion is a combination of oils and waxes which is specially designed for your car. First, the current condition of the car is assessed through endoscopic examination. Next, the entire underbody is cleaned using dry ice blasting and prepared for the subsequent treatment. 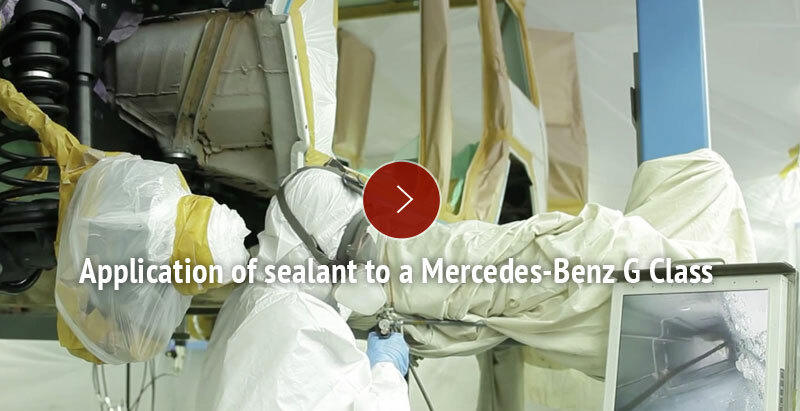 Before the actual sealant is applied, we use a special pre-sealant that penetrates into every cavity of the car body. The basic ingredient in the pre-sealant is an environmentally friendly oil containing chemical components such as phosphates and tannins. Finally, the application of a wax sealant prevents moisture and air from reaching the car body. After all layers have been applied, endoscopic examination is once again carried out. We closely inspect our work, and touch it up wherever necessary, until your car body is protected down to the last crevice. For this form of anti-corrosion protection, it is not necessary to disassemble the entire car body. At most, fixtures such as ornamental trim, bumpers, headlights, sub-panelling or exhaust pipes may be removed. Superficial observation reveals only the visible areas of rust on a car, and not the hidden corrosion damage in cavities and difficult-to-reach places. 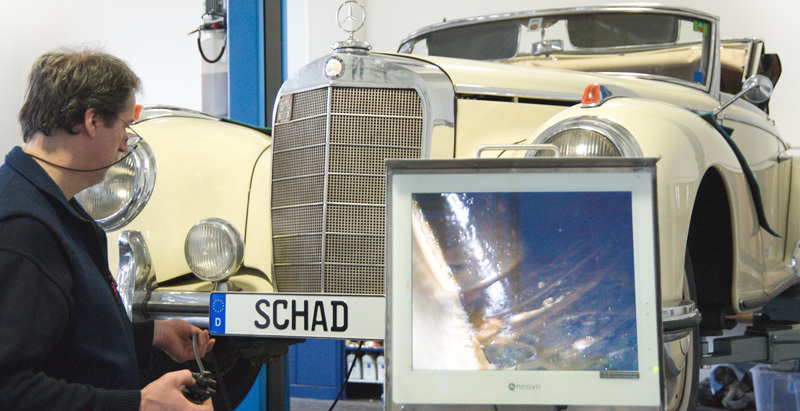 At SCHAD Oldtimer Manufaktur, we use endoscopic examination to find out where your vintage gem’s weak points lie and what form of anti-corrosion protection will be right for it. With an integrated camera and a high-quality prism lens, we can subject all cavities to an exact examination. We save all photos and provide them to you on a CD. Naturally, you are also welcome to observe our diagnostic experts live while they carry out their check-up. Ensuring that the process will achieve the desired results requires not only an experienced specialist, but also a high-quality instrument. We use a state-of-the-art endoscopic device manufactured by the German company Karl Storz GmbH & Co. KG. Originally developed for medical use, it offers extremely high resolution and above-average light quality.